Look back at the accomplishments in 2018. Blog / Look back at the accomplishments in 2018. New Year’s traditions are not only bright hoopla, but this is summing up and planning for the coming one. 2018 can be called the year of the fall of Bitcoin and the interest in the blockchain. However, experts believe that after passing through the formation phase, the blockchain will become a breakthrough technology for business. 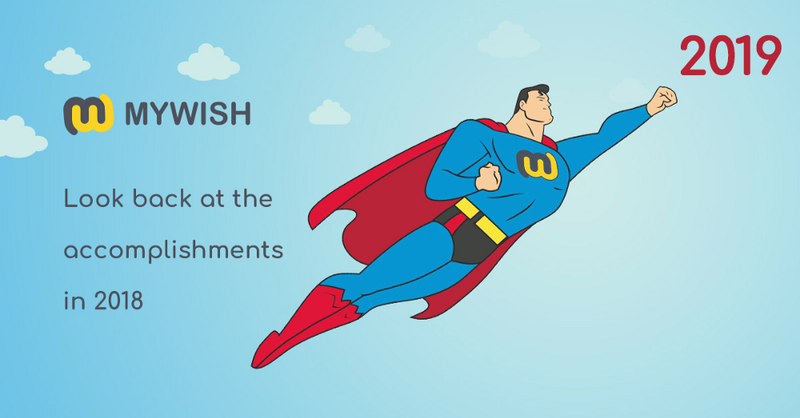 The MyWish team has reached many heights this year and wants to remind of the main breakthrough events. 6005 users created, 4065 smart contracts, 120+ real projects used the platform for their business, the core team visited 15 crypto events and developers integrated 4 blockchains and created 7 new types of smart contracts. January was started with the renewal of the most sought-after Crowdsale smart contract. Now it has all functionality needed for Token Sale/ICO. Using MyWish builder anyone can setup & launch their own crowdsale contract. You can set up pre-ICO conditions, all types of bonuses, reserve some amount for Team, Bounty and much more. In other words, the contract has become even more customer-oriented for users. Without stopping on what has been accomplished one more blockchain was integrated on the MyWish platform. May 2018 is time for the Neo Smart Contract. Together, MyWish managed to integrate the creation of complex smart contracts such as Token and Crowdsale on the platform without using code. With this blockchain, we had trustworthy relations and subsequently, they asked to develop Neo Testnet Tools and organize the joint first Meetup in St. Petersburg, Russia. This became a very valuable and trusting experience for us. Further, thanks to the needs of users, we have created and added new types of smart contracts such as Investments pool and Airdrop. Now you can not only run your ICO but also participate in large fundraising with minimal investment and distribute tokens to 100 addresses at a time. After a year MyWish company expanded own borders to this is evidenced by an extensive network of ambassadors around the world and the adaptation of the site into Chinese and Japanese. Furthermore. In the summer, Mywish became the first platform for creating smart contracts on EOS. Enlisting strong community support, we managed to implement the function of creating an EOS account without the usual difficulties. Especially for the creators of smart contracts was created EOSISH token that was distributed to all EOS&WISH owners during the major airdrop. By the end of the year, new payment methods such as fiat and BNB theBinance official coin were added to the service. It was decided to declare a course on active partnership, at the moment we are going through mutually beneficial integration of MyWish services to Crypto tools. MyWish keeps looking for projects (wallets, trackers, exchanges, funds, etc.) where they place the “Create Token” button. Thereby contributing to the formation of a convenient infrastructure for blockchain users and an increase in the number of people who use the unlimited possibilities of blockchain technology without programming skills. The service strives to be the first in the segment of smart contracts and for this, it is worthwhile to thank the competitors who were left behind giving an incentive to work even harder to be the best rightly. A year ago, the MyWish project was in the position of catching up: there were 2 leading projects: BlockCAT and Etherparty and a year later MyWish kept all its promises and occupied the status of the leader in the smart contract industry. Summing up, the dynamics are quite positive, and in the future, the blockchain will only develop more actively and faster. The next news in 2019 is the smart contract for the TRON blockchain. The official release is scheduled for January 1, keep an eye on your crypto calendars. Sure, one of the most important goal for 2019 is listing on major exchanges. The MyWish multi-chain platform goes on holidays until January 15 and congratulates the whole involved community on New Year 2019 and wishes a green market. If you thought that was all, then no, a Christmas gift is already prepared for you. Starting from today enter “SANTA” promo code and get 50% off any contract till the 15th of January inclusive on the MyWish platform. Do not miss this opportunity! The holidays and the New Year are a time of reflection — a time to give thanks and to appreciate those who have given you support. Sincere thanks go out to all in community and investors for continued support and dedication. “We are truly grateful, we grow and develop with you and for you!” — MyWish Team.